For this week’s blog post, we’re giving you a glimpse into the behind the scenes of Pleasant Pops. Without sharing too many secrets it’s exciting to let you in on some of the quirky, silly and ultimately unique characteristics that make Pleasant Pops Farmhouse Market & Cafe the place it is. Nine of the following facts are true, and one is a lie. Can you guess which? We hand polish all of the silverware. Since we don’t have a conventional dishwasher in the back, every dish, bowl, spatula, blender and fork goes through a three-sink wash, rinse and sanitize process.Thankfully, our wooden salad bowls, porcelain soup cups and many mugs dry quickly and splotch free, unlike the metal spoons, knives and forks which we polish by hand, every minute of every day, to ensure you can spread your jam on your croissant with a sparkly clean knife. 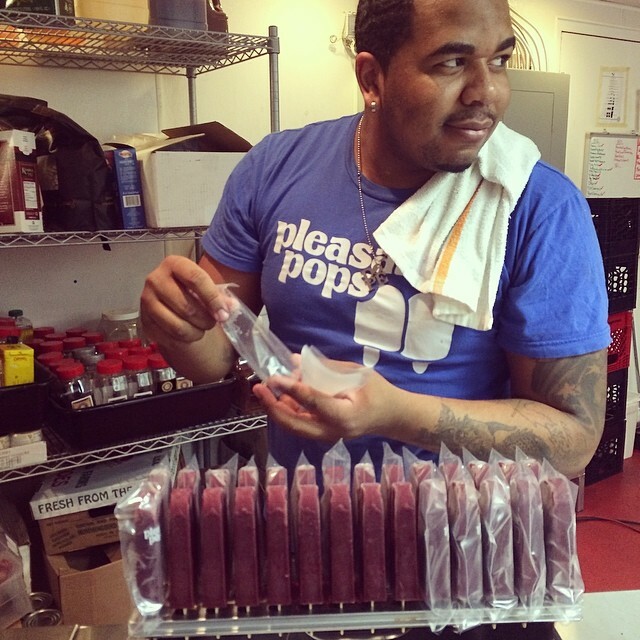 On Pop making days, if there’s an extra mold to fill, we will often experiment and try out new flavors. This is how many of your favorites have been created, but also how many less delicious, one-time-only pops were made and quickly discarded. My favorite trial and error pop was the Espresso Pop, made simply from four shots of espresso. Though one lick gave me a caffeine boost through the roof, eating any more of that pop would have led to sure disaster. During your break at work, you are free to make yourself a meal, either from our menu or of your own creation. To help employee morale, Pleasant Pops has acquired a vintage packman arcade game which lives in the back office and is free to employees to use during free time as a stress reliever. While all using pseudonyms to record our high scores, the leading champion right now is “Ursula” with a score of 131,896 points. There is an independent sound system in the kitchen which is controlled by either the kitchen staff or those making pops. About 50% of the time, Bachata, a popular genre of music from the Dominican Republic is on, which makes you want to shake your hips and blend some hummus. If not Bachata you’re bound to hear: Drake, Rhianna, Nickleback, Red Hot Chili Peppers, Bruno Mars (if I’m in the back) or The Grateful Dead (if Roger and Ben are making Pops). Our two full time kitchen staff, Robin and Demetrius, each have pretty important nicknames. Whereas Robin simply prefers to be called “Versace,” Demetrius is most often called “Meetchers”. It’s easy to tell who is working in the kitchen on a given day: Robin will cut off the “butts” of the baguettes whereas Demetrius will leave them on. Different strokes for different folks. When the internet stop working and you get really irked because you’re working on your PhD research, we too get frustrated. After trying simple fixes like a re-boot online or unplugging and re-plugging our router in the cafe, if the internet is still not working we have to go in the back and get creative. Our modem lives in a very inconvenient, hard to reach spot that involves a ladder and, for some of us, standing on our tippy toes. We feel your pain. The wallpaper in the customer bathroom was custom made for Pleasant Pops. It not only uses our beloved “two-pop logo” but is printed in the shade of blue from the original Pleasant Pops color scheme. Meant to give the bathroom a more fun and peppy look, the wallpaper was a thrill to design but, as anyone who’s ever worked with wallpaper knows, a pain to apply. There’s a mysterious parking spot right in front of Pleasant Pops that has no real parking meter to which it’s responsible. Though someone working the opening shift is bound to snag it at 6:55 am, if you happen across it empty one day, better grab it while you can. Once in a blue moon a car parked there will be ticketed, but I think that’s a bunch of hooey and I’ll be ready to stand by your side when you fight that ticket in court.